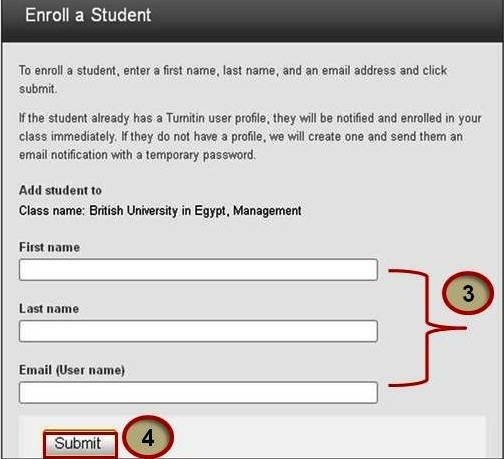 Self-enrolling by using "Enroll in a class" option if they already have had accounts on Turnitin or "Reset pasword" option if they forgot their passsword; but if they were 1st time users, then they should create a user profile using the class ID number and class enrollment password. The instructor can enroll students in a class one by one using "Add Student" or by uploading a list of e-mails and student names via "Upload Student List, then a student will receive a confirmation e-mail. If the student has an existing account, the confirmation e-mail contains only notification of the new class enrollment. If the e-mail address was not for an existing student user in Turnitin the confirmation e-mail contains a temporary password and login instructions. New student user profiles that have never logged in are indicated with a pink highlight over the enrollment date to the left of the student name on the student list page. Click "submit" to enroll the student. A welcome e-mail will be sent to the student. 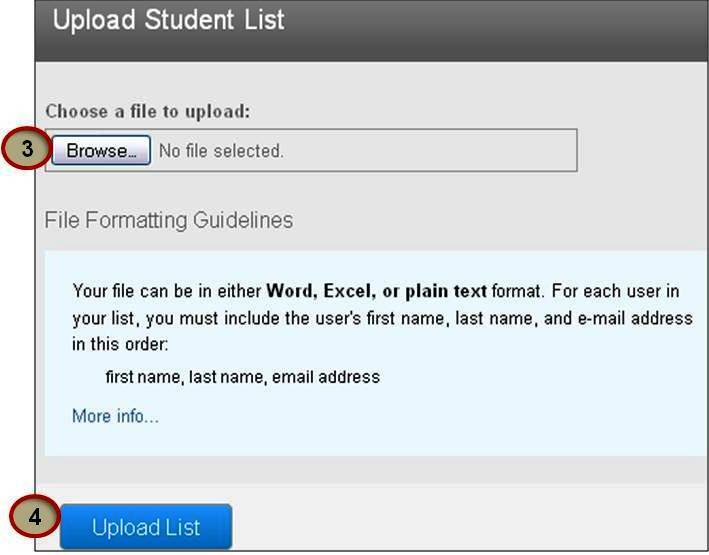 An instructor may upload a student list to add to a course. This list must be (100) entries or less. Larger classes may be separated into multiple lists, each of which can be uploaded individually. Click "Upload List" to upload your list. The student list will be displayed. Check the displayed list for errors. To submit this list, click "yes, submit." If the incorrect file was selected, choose "no, go back" and select a different file for step 3. The final screen will display the newly enrolled list of student users. Click the "return to students" link to return to the class student page, where you can send an email to your class using " Email All Students" link or click on each student's name to view his /her submission. Move to the next page to Submit a paper as an instructor for yourself or on behalf a student.